Let’s examine what it means to be selfish. To have our cake and eat it too. To give ourselves the gift of time. To host a deep-sit with our deep seated needs and not shy away. To take our babies out of the corner and put them on a pedestal so high that everybody can see. To light a candle for every crevice of ourselves emerging from a shadow. If there’s anything I’ve learned about selfishness and shadows, it’s that they are a parallel of paradoxes. Sometimes being openly selfish is the biggest gift you can give. You give permission by self-aligning, self-promoting, self-serving. As in service. Service to yourself is service to the world. Yesterday's full moon in Aries turned the focus on ourselves and set a tone for a transformational tune. Think lady in a gospel choir belting loud and proud. Think about the choir hopping on the bandwagon. Think about the pews, one by one enrolling in the anthem. Think about the girl walking by the church tapping her feet, breaking into dance all the way down the street. This week is like that. A rock in a lake. A ripple effect. The Ten of Pentacles is a solicitor of service at an angle of abundance. It’s a card that reminds we are too blessed to be possessed by shame and resentment. Put a little delight in your plights with the knowledge that service to yourself gives everyone permission to pass their personal thresholds. When we halt our creations and causes we hold each other back. 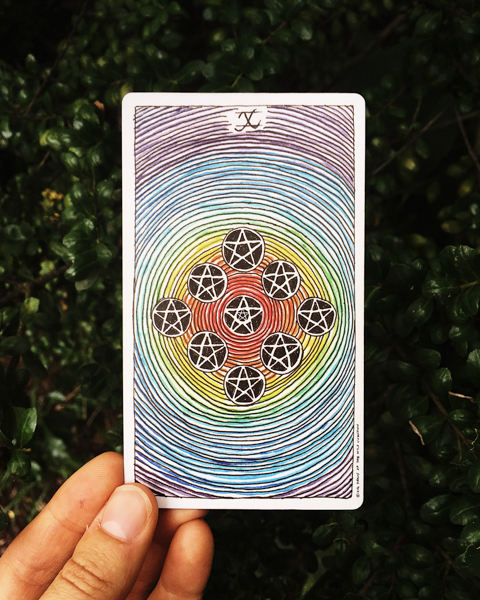 The Ten of Pentacles is asking us to hold space for ourselves as a way of holding each other – and vice versa. One of the biggest gifts you can give is your time so play hostess with the mostest and invite your bffs over for gratitude. Entertain yourselves with everyone’s visions. Be both selfish AND selfless. Compose, rearrange, and say okay to singing in the rain. Then marvel as each little ripple whirls and swirls into a symphony.